In celebration of St Patty’s day, the patron saint of hamburgers or somesuch, and also in the spirit of completevism (you get to 50 odd reviews and you start wanting to know the totality of a line), here’s our review of the little brother of the Bushmill‘s line. Try it? 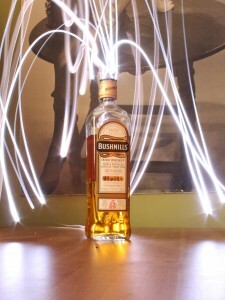 If you’ve never had a Bushmills, maybe. Buy it? No, buy Black Bush.